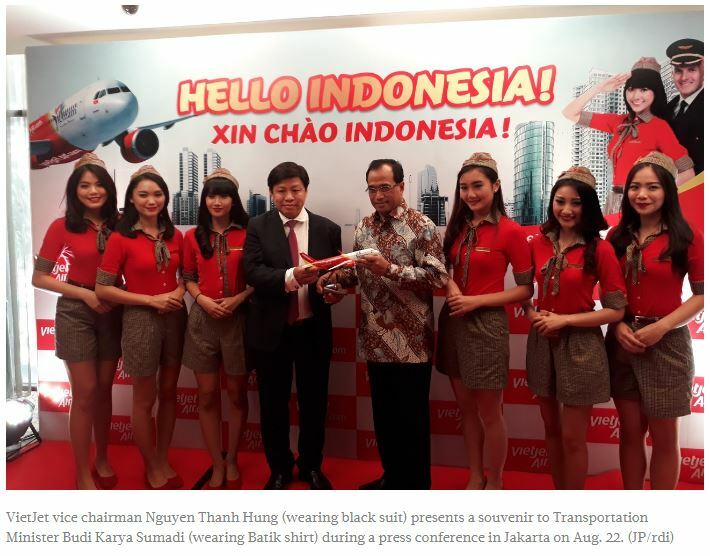 Vietnam’s airline VietJet Air is to open routes from Ho Chi Minh City to Denpasar in March and to Jakarta by the end of the year, said VietJet Air managing director Do Xuan Quang during the recent ASEAN Tourism Forum (ATF) 2019 in Jakarta. “I assure [you] that starting March 2019, we will fly to Denpasar, Bali. For the first six months, we will fly four times a week and then we will fly seven times a week,” he added as reported by� kompas.com� on Monday. The flights of the airline, whose female aircrew members have been known to wear uniform bikinis while� on duty,� would use the new Airbus 321 plane that has a total capacity of 226 passengers, he said. The opening of the routes is very important for Indonesian tourism, said Tourism Minister Arief Yahya said, adding that tourism in Vietnam grew 21 percent in 2018 and 30 percent in 2017, while the Indonesian tourism industry only grew 14 percent in 2018 and 20 percent in in 2017. “The keys are deregulation and the application of technology — a digital technology,” he said, adding that the ministry would take part in promoting the new route from Ho Chi Minh to Denpasar. He also said 75 percent of tourists came to Indonesia by air, therefore the government needed to develop airports, airlines and fight navigation services. “I have a 3A formula – attractions, access and amenity to develop destinations. To achieve the target of 20 million arrivals in 2019, the tourist access to Indonesia should be widened,” he said, adding that the low-cost VietJet Air has started flying to 35 cities in China.